EchoTime is no longer available to new users. If you have not previously registered EchoTime, you will not be able to register or use it, so please do not download it. EchoLink installed and running in -L or -R mode. Microsoft SAPI 5 Text To Speech Engine installed and working. Weather Exchange from Ambient Weather installed to gather your local weather information. EchoTime TTS Plus uses the API of EchoLink by K1RFD to provide additional functions that may be useful to someone operating an EchoLink node. The EchoLink voice is replaced by a Windows Text To Speech voice. The program will work only with an EchoLink node that is configured with a radio, it will not work if EchoLink is configured in the computer user mode. For help with EchoTime TTS, visit the EchoTime List HERE. Please read about EchoTime TTS and the system requirements BEFORE you download it. Your system must have Microsoft Text To Speech INSTALLED and WORKING before you install this program. System Requirements - EchoTime TTS requires the Microsoft Text To Speech Engine be installed on the computer that EchoLink and EchoTime are running on. The TTS Engine is included with most versions of Windows XP and may be included with other versions of Windows. If you have the Speech Icon shown to the left in the Control Panel on your EchoLink computer, you have the SAPI 5 engine installed. If you do not have SAPI 5 installed, I would recommend that you download and install the Microsoft Text to Speech SDK 5.1 (Software Developers Kit), which is free, and includes some useful tools. The speech SDK is a free download here: Microsoft Speech SDK 5.1 You need to download and install 'Speech SDK 5.1' (68 mb). SAPI 5 is not distributed with EchoTime TTS and must be installed before installing EchoTime TTS. Before installing EchoTime TTS, you need to verify that you have the Text To Speech Engine installed and working on your computer. TTS is a not a component of EchoTime, it is a component of Windows. From the SPEECH icon in the control panel, click the TEXT TO SPEECH tab and then select a default voice. Click the PREVIEW VOICE button to hear the voice speak. If you can hear the voice, you can use EchoTime TTS. If not, EchoTime TTS will NOT work on your system. If you are using Windows XP and you have the SPEECH Icon in the control panel, but the TTS voice will not work, read this Technical Note from Microsoft. 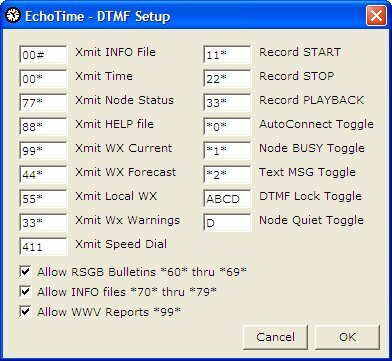 INFO File Announcements - EchoTime TTS will play a WAV file at specified intervals, or can be commanded to play the file using a DTMF pad on a radio. The file is played over the local radio only, and not sent to connected nodes via the internet. Sample INFO file. 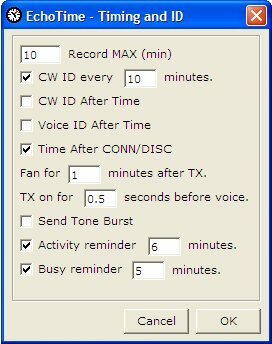 HELP File Announcements - EchoTime TTS will play a WAV HELP file when commanded to play the file using a DTMF pad on a radio. The file is played over the local radio only, and not sent to connected nodes via the internet. Sample HELP file. Local WEATHER Announcements - EchoTime TTS will automatically compile local weather information that is updated over the Internet. The program compiles two weather files which can be played over the local node radio using DTMF commands - a 'current conditions' file and and a 'current forecast' file. Sample CONDITIONS file. Sample FORECAST file. 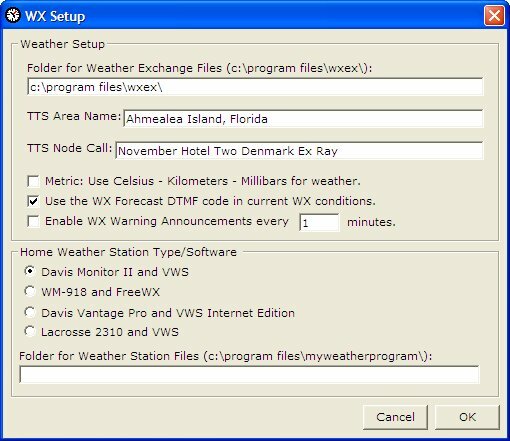 To use the weather function, you will need to install a free desktop weather program called Weather Exchange from Ambient Weather which will automatically collect and update your local weather information. Weather Warnings from Weather Exchange can also be announced at configured intervals. If there is a local (home) weather station available, EchoTime will announce weather conditions from the home weather station. When configured with a home weather station, there are three DTMF weather announcements available. 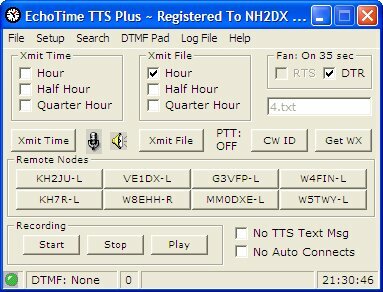 TIME Announcements - EchoTime TTS will announce the time at specified intervals, or can be commanded to announce the time using a DTMF pad on a radio. The time is announced over the local radio only. Sample TIME announcement. Call sign SEARCH - EchoTime TTS will retrieve information for a call sign specified from several Internet databases. Information includes name, address, email address, web site if any, and EchoLink node information. CONNECTIONS/DISCONNECTION Announcements - EchoTime TTS will announce all connects and disconnects over the local node radio. EchoLink has this function, but in order to maintain voice consistency over the local radio, EchoTime does also. Sample CONNECT announcement. Connection Scheduler - EchoTime TTS will allow you to configure up to eight other EchoLink nodes which can be scheduled for timed connects/disconnects or configured for constant connections. Each node can be configured for three time periods of connection during the day, and days of the week can be selected for connections. Recording and Playback of QSO's - Recording can be stopped, started, and played back using a DTMF pad. Node STATUS announcement. - The program will speak a list of connected stations, and also the status of the available toggles. Sample STATUS announcement. CW ID. - at user specified intervals, from a user supplied WAV file. Pause BEFORE and AFTER voice announcements. - a user specified amount of time, to to avoid problems will radios that key slowly. User Configured DTMF sequences - You can configure the DTMF strings used by EchoTime to avoid any conflict with the ones that EchoLink is configured to use. EchoTime TTS supports control of the following functions: play info file, play weather conditions, play weather forecast, play help file, say current time, toggle auto connections on/off, toggle node busy status on/off, and start, stop, and playback recording of node audio. EchoTime TTS also provides the function of a configuring 'shortcuts' to connect to the eight nodes that are configured in the scheduler. While EchoLink also provides this feature for connecting to other nodes, it does not provide the feature of selectively disconnecting a connected node, which EchoTime TTS does. EchoLink gives you the DTMF capability to disconnect the LAST node connected, or ALL nodes, but EchoTime TTS will allow you to selectively disconnect any configured node. COM Port Line Control - The program will allow you to use the COM port line that EchoLink is not using (RTS or DTR) to drive a circuit to control an optional device, such as a fan for the node transmitter. The extra line, if selected, is held HIGH while the node radio is transmitting, and for a user configured amount of time after the radio returns to the receive mode. Dave, G3VFP, has designed a nice circuit for controlling a fan. I'm using one here with EchoTime. For information, visit Dave's web site. Dave also makes some very nice EchoLink radio interfaces. The program is "polite" - scheduled audio events will be ignored if the node radio is receiving. Some audio events will be mixed with incoming audio from the Internet. Local DTMF Pad - which can be used for testing and setting up EchoTime TTS Plus. Disconnect the local radio and replace it with a speaker to configure and set up the local TTS voices and the files the voices will be speaking. 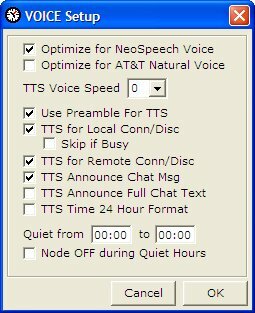 Enhanced TTS Voice Setup - provides more options for configuring the TTS voice. Optimize for the TTS voice being used. Five speed selections for the TTS voice. Skip Local conn/disc if busy. Enable/Disable chat message received announcements. Tone Burst - from user supplied WAV file. Activity Reminder - from user supplied WAV file. Busy Reminder - from user supplied WAV file. Courtesy Tone - from user supplied WAV file, after TTS Voice speaks. To disable the tone, remove the BEEP.WAV file from the WAV folder. You can use the same tone for EchoLink's courtesy tone (after internet audio) for continuity. 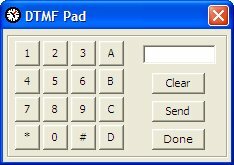 DTMF Forecast Code Disable - Prevents the DTMF code for weather forecasts from being spoken in the weather conditions file. DTMF Voice Abort - On a full duplex link, the DTMF code "A" will abort the file the TTS voice is currently speaking. Timing Enhancements - EchoTime TTS Plus has a number of internal timing enhancements, which increase the usability of the TTS voice features. Future enhancements, additional features, etc. for the TTS versions of EchoTime will only be added to the EchoTime TTS Plus version. Suggestions for changes, additions, and extra features are welcomed from registered users of the program. Corrected versions of voice dictionaries for the NeoSpeech and AT&T Natural Voices are also available to registered users on request. These dictionaries correct minor 'quirks' that have been noted with the TTS voices. To see all the features of EchoTimeTTS Plus, you can download the HTML HELP file HERE. Previously registered users click HERE to download EchoTime TTS Plus.